For today’s companies, there continues to be an enormous risk of identity theft. Whether it’s through the interface of company computers, hacking of email accounts or even cell phones. There is one way to prevent identity theft from infiltrating your business – hiring a secure document destruction service. It is important to choose a vendor that is trustworthy and capable of providing a safe and secure shredding environment. 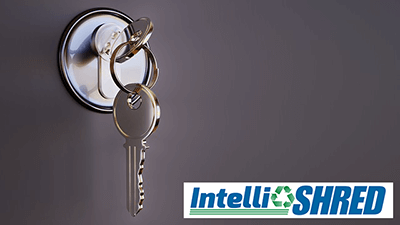 Secure document destruction will efficiently shred or destroy your confidential documents and files. Before you hire them, it’s crucial that you ask these questions. What are the steps of their shredding and destruction process? Secure document destruction can help your business continue to be productive, saving you time and money. The only thing is, the vendor you choose should be able to walk you through the steps of their process. You should feel confident that your sensitive information is being destroyed or recycled safely and securely. Typically, vendors will give your office few bar-coded collection bins so that employees can easily drop in documents. When the bin is full, the vendor sends someone to scan each bin to record the fill level. Then, if the vendor has a mobile shredding truck, documents are shredded on-site. If not, the bins are transported to a secure shredding facility. 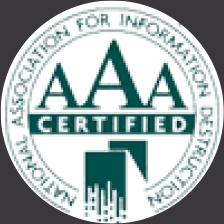 The vendor should always provide a Certificate of Destruction for your records. The best service providers will ensure that your shredded material is either recycled or destroyed. How can they ensure my sensitive or confidential information is safe? It’s wise to uncover the vendor’s operation standards so you can determine if your documents will be safely destroyed. Usually, if the secure document destruction service is worth hiring, they will make security a top priority. Their employees should have signed a confidentiality agreement, gone through extensive background checks and have participated in extensive training to do their job. Employee security is absolutely crucial – be sure the company has hired ethical people by asking about their hiring process. There is a special need for medical service providers to make sure their vendors are working within HIPAA standards as well. Do they handle E-waste as well as paper documents? This question will help you decide if a potential vendor has the ability to offer a comprehensive electronic shredding solution. Like paper records, hard drives, tapes, and compact disks also contain sensitive information. Deleting or overwriting these devices still leaves your data vulnerable to unauthorized access. Besides destroying your paper records, the right shredding and destruction partner will also shred your media onsite. Whatever vendor you choose, be sure that they offer mobile shredding services. Sometimes, with off-site shredding, the transporting of your documents from your office puts them at a higher risk of being lost, misplaced or getting into the wrong hands. There are shredding companies that provide mobile, on-site shredding, as well as emergency shredding services. Make sure you choose the right vendor for the needs of your company. 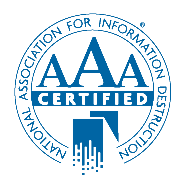 IntelliShred has years of expertise in secure document destruction – we’re NAID certified and we’re able to successfully help companies protect confidential information. Contact us today to find out more about how we can help your business.